As eight Seeds of Strength members gathered for a site visit at the Williamson County Children’s Advocacy Center in early April, they were greeted by stark, black silhouette cutouts of various- aged kids, each of which graphically point out chilling facts about child abuse. More than 90% of abused children know their abuser. Only 1 in 10 tell of their abuse. 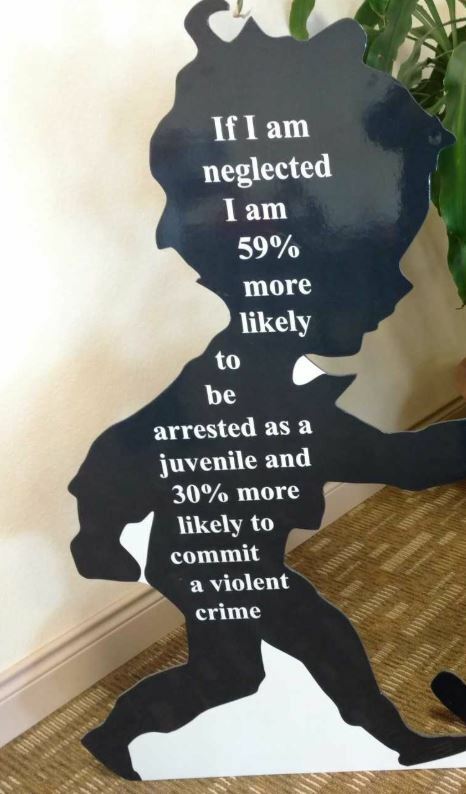 If a child is neglected he is 59% more likely to be arrested as a juvenile and 30% more likely to commit a violent crime. The Williamson County Children’s Advocacy Center, or WCCAC, is one of 71 advocacy centers in Texas and one of 850+, nationwide. Originally founded as safe places for abused and neglected children to tell their story once, rather than many times, to many different people, CAC’s are the first stop in child abuse investigations. Over the years CAC’s have grown from providing only Forensic Interviews into multi-faceted programs, which not only include Forensic Interviews, but also Sexual Assault nurse exams and Safe Child Exams, trauma based therapy for children and non-offending family members, family advocacy, and child abuse recognition and reporting education. The original SOS grant was to cover Safe Child Exams, for which there is currently no dedicated grant money available. As the WCCAC began to explore adding a nurse for the exams, it became apparent that not just any nurse could fill the bill. A nurse, highly trained to provide both Sexual Assault Nurse Exams and Safe Child Exams and to be able to testify in a court of law was required. There were no available nurses in the area. So the Advocacy Center requested a modification and an extension to the grant in order to train a nurse. That trained nurse has now been joined by two other trained nurses who have opted to join the Advocacy Center team. It also became apparent during this process that many children were not receiving the medical attention they needed. The distances and expenses involved to take a child to Austin and Temple were prohibitive for many parents as well as for law enforcement and Child Protective services; therefore, many children never received a medical exam of any kind. So the idea began to take root – why couldn’t the WCCAC be the go-to place for these medical exams during the work week? Originally three nurses operated on an on-call basis. Now between those three nurses, exams are provided five days per week, and in extreme cases, on an emergency after-hours basis. As a result, more children have the benefit of SAFE Child Exams and Sexual Assault Nurse Exams; children are being examined faster and more consistently than in the past; and sadly, more children are receiving medical testing for sexually transmitted diseases. In the first quarter of 2018 the nurses completed ninety-five medical exams as compared to seventy-one completed in the entire twelve months of 2017. The WCCAC is so deeply grateful and appreciative for the investment in our medical program by Seeds of Strength. Because of the SoS grant, at least eight children have been removed from their homes, due to the physical abuse findings by our specially trained nurses. Prior to this grant, these same children likely would have been returned home, due to not having access to a SAFE Child medical exam. The nurse’s photographic evidence which documented extreme bruising, cuts, burns and scars that were previously hidden by clothing, was key to not returning a child to a dangerous environment. Since I have been the WCCAC Executive Director, the SoS grant, hands down, has been the most transformative funding received. Because of the grant, we were able to not only train a nurse and conduct sixty-three SAFE child exams, but also to provide the genesis of what we hope will be a long-running nurse exam program that will benefit the children of Williamson County for years to come. THANK YOU, Seeds of Strength. Truly, SoS members can be proud to be helping this worthy and most necessary non-profit.